I’m coming to you a day late with this week’s Pink Candy. Oops! Life has been a little busy around here. I worked on housework all day yesterday and a little bit of sewing. Today I wanted to pop in with my Pink Candy Giveaway! Enjoy! Yes, yes, and yes please!! It’s been a busy week around here. I have a new craft room and have about half of my stuff moved in, but not put away…….ordering new shelves. So very thankful! Love the stamp set. Thank you for your generosity. Love your card samples. Keep up with the giveaways. You are so generous like that. Yes please keep up even when we seem like we are not watching, WE ARE! Love the card! Been snowed in here, so nice to see something Spring-like! Cute stamp set! Love the giveaways! Love all of your pink. As a breast cancer survivor the color is dear to my heart. Yes, please continue the giveaways. I don’t enter every time because either I have the stamp set already, or it’s just not my style , so I want o give others a chance. Your inspiration is great! This set is so cute. I love the giveaways please continue them. Yes please I’m new to your site and just placed my first order with your SNU few weeks back. I did see your instantgram giveaway but for sone reason could not enter don’t know what I did wrong. Thank you and I hope you do continue. Yes, please continue the giveaways. This set is so cute. Love your give ways. sometimes I don’t see the post until several days later.. The stamp set is cute. I was missing in action for a couple weeks because of a family tragedy. I’m still very sad, but want to participate in your giveaways!! Thanks for all you do, Robin. Love the giveaways! Your videos alone are a gift. I think some days just get away from most of us. I would rather sit in my craft room and play all day however, that is not going to happen. Very odd that there were only 4 entries! Yes! Keep doing your Pink Candy giveaways! They are awesome! I love your giveaways. Sometimes I am so busy at work that when I get home I am to tired to do anything. I always make sure to watch your videos though. Thank you for everything you do. Thank you for all the time you give to us with your tutorials. I am glad for the ideas since I have a hard time creating on my own. Wow, looks like we still want you to do giveaways. Thanks for bring so giving to us. Thank you for being who you are! I appreciate you as my upline! Your designs are wonderful. Please continue the give away. Really enjoy your giveaways. Thanks for the chance! Love your giveaways! Cute stamp set. Thanks for another chance to win a stamp set! If I have the set or it’s something I wouldn’t use or could gift to someone else, I don’t comment There are so many others who could comment to win. I love your giveaways! Please continue! Thanks for all you do! You are appreciated so much! For some reason, I do not get or see all of your posts or emails. When I do, I respond. You are such an inspiration and wonderful business model. Please continue your giveaways. Last week was crazy. Thanks for all that you do!!! Cute stamp set. You really motivate me, and I need that!! I love the giveaways but I don’t comment if I have the set or if I feel that I wouldn’t use it very much. I’d rather let someone who really wants it have a better chance of winning. Today’s stamp set is one that I looked at several times in the catalog. I really like bird images. I just joined up with you. Please continue your fun giveaways! Thanks for all you do !!!! The giveaways are nice, but the real treat is watching your videos. I love your ideas. They spark creativity in me. I don’t always have time to watch everything right away, but love seeing your videos. I really wanted this set but didn’t get to get it! I say continue your weekly giveaways…they are fun and exciting! Love all your videos and tips! I enjoy your videos. You make them fun. I love your giveaways but busy life only allows me to catch up with your post very late. Love all your creativity as well. Please continue to share. My first post did not show up on the comments! Please do not stop your giveaways! Life, also, gets in the way of your many readers! Don’t lose heart. You are very much appreciated. Your videos are awesome. Thank you for sharing your time, talents, and creative imagination with us. Please do not stop your giveaways. Life also gets in the way of your many readers. Thank you for all you do. You are appreciated. Your videos are awesome! Life gets in the way and I don’t always get to check your blog as much as I would like. Keep doing your give aways. I have a chance to win from you. I never win from other sites. Love all your videos, and this stamp is great. Yes, continue your weekly giveaways! I’ve never left a comment figuring that I never had a chance of winning anything……. bad attitude huh?! I do look at all of your posts and as a beginner stamper I find so much inspiration and information from you. Thank you for all of your work that you put into your posts for us, I appreciate it as I’m sure many others do. Blessings to you and your family. I love your videos and the stamp set is the so adorable. I’m surprised if I didn’t enter but I’ve been busy. I love all you do for your customers! 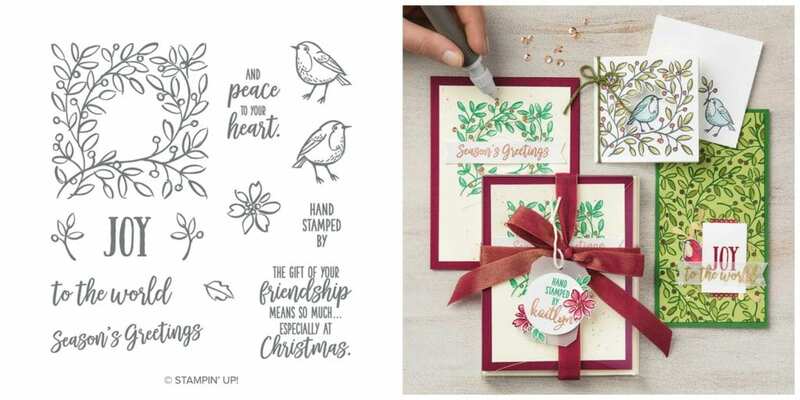 Love the stamp set and love the fun giveaways! Yes! Love all you do! I love your giveaways. Please dont stop sharing your t a’s lent. You are an inspiration. Please don’t stop. Yourgive aways are awesome. Don’t know how I missed the last one. Please continue. Love this set…sometimes I don’t comment because I have the set and want to give others a chance to win it. Otherwise, I love your weekly giveaways!! Thanks for all you do! Yes keep doing your giveaways. I like all your projects too. Please keep up your post and giveaways. Like others I don’t post when I already have the set. Or, it’s just not something that I think I would use letting someone else have a better chance of winning. I love your weekly giveaways! People probably just missed last week’s…. hard to believe so few comments! Love these pretty creations with the Feathers & Frost set! I love your giveaways and think you should continue! I just haven’t been very active in my crafting since I started teaching but I’m getting back to it! I try to look at your post but too many times, my non-crafting life interrupts my crafting life. I do try and check in frequently so yes please keep them coming. Love that you always have different projects going. I love your giveaways, but especially so when I win!! Thank you so much Robyn! How fun to see my name! Yes, please keep this up. Hopefully I’m not missing anything. Now have a dog that had one major surgery and in 3 more weeks another. But I think I’m keeping on top of this. Love your great ideas. Yes, It would be nice not to have to scroll a lot of comments though in order to leave a comment. I don’t have that set but thought about it. It would be lovely to win it! Nice stamp set. Please continue. Thank you. Love this one. This is a nice set. Please continue your giveaways! This is a very nice stamp set. Please continue your giveaways!! Never stop the giveaways, lol!!Thanks!!! This is one of the prettiest sets. I love all things BIRDS! (I wonder why?) lol…Life gets a little busy sometimes. I love your giveaways. Last week we were dealing with the flu. The littles went back to school today, so hopefully life can be normal again. Oops, forgot to say that I love the stamp set!!! Please continue your give aways. I’ll be sure to comment even if I already have the product – I’ll just comment that I already have the product so don’t include me. But it’s nice to know you are appreciated and for that I apologize for not commenting. Hugs, Robyn!! Yes, please continue your giveaways! I thought I commented last week. That is crazy that you only had 5! I love your giveaways. Please don’t stop doing them. I totally missed it in your post last week. Too excited about the class. Lol. And sometimes if I have the set, I won’t comment so someone else has a chance. Have a great day! That’s CRAZY that you only had 5. I know I missed last week…it was a crazy week. I love your weekly giveaways though!!! Yes please!!! I love your posts and project ideas and giveaways!!! Life was a bit crazy for me last week!!! Thank you for everything you share with us!! Please continue the giveaways. I love your videos and projects!! Thanks for sharing your talents, and for the chance to win! Definitely please continue!! I enjoy the chance to win something! I would LOVE to win this set! Birds and Christmas go so well together! Don’t stop! I check and comment your blog every day! Well almost! Part of my daily inspiration routine. And if I win…well bonus! I am so sorry I have been absent. I have been very busy! I see my new Paper Pumpkin is on the way! So excited. How is your newlywed daughter doing? NO don’t stop. Love the chances. And love all that you do!!!! Wonder if there was a glitch. Hugs!! This is a perfect reward. Don’t stop. I don’t think you should stop the giveaways. I’m sure all the bad weather has been affecting everyone in some fashion. We love your giveaways! I love the cute little birds in this set. Thanks for all you do for us. Hi Robyn- we’ve had lots of weather issues in MN this month so haven’t always had my internet! Finished 2 of my 3 retreat classes – so pretty! I like the giveaways but don’t always remember to go back and comment if I don’t do it immediately! Love your giveaways very much 🙂 Thank you, thank you! This is a very pretty stamp set. Have a wonderful day! Don’t quite. Would love to win this week. You give away the best things. My first comment didn’t take?? Wonder if that might be the problem? I love the giveaways, love the FB, love the blog, love your videos, and SUPER love your classes. Just finished some treat boxes for coworkers and we will be making Valentines with Hey Love tonight!! Only 5 entries!?! Crazy. I am making the kids Valentines tonight with Hey Love, CANNOT WAIT. Made all my treat boxes for the kids birthdays with “Take Home Treats”, bought the class. Love your page, love your insta, love the giveaways. People were probably just recovering from a super fast January! Yes! Don’t stop the giveaways! Lol! Love all of your inspiring projects, Robyn! Yes, please keep doing weekly giveaways! I’m usually a little confused as to where to leave a comment to enter though. I quit leaving comments because I never won anything andgot discouraged. I do always read your posts and watch your videos, though. I think you should continuethegive aways because you have so many followers.